Last year I wrote a blog entitled, “What's Your Safety Personality? Personality Assessments For Safety” discussing Talent Click’s study on how organizations can improve their safety culture through utilizing personality risk assessments. Today I wanted to revisit this and discuss a bit more on the importance of finding your safety personality. At the 2003 Oil and Gas Industry Safety Conference in Perth, Australia, the Industrial Psychology Research Centre stated that close to 90% of workplace injuries are due to human error. Numerous other studies have confirmed similar findings. We all are driven by certain impulses defined by our personalities. So, by determining what our impulses are, we can better figure out how we can minimize risks and how to be more aware of our decisions. Having this information can assist in improving your safety culture in the workplace. One of the ways of doing this is through personality assessments like Safety Quotient™. Safety Quotient™ is a psychometric tool that is used to measure safety risk personality traits. 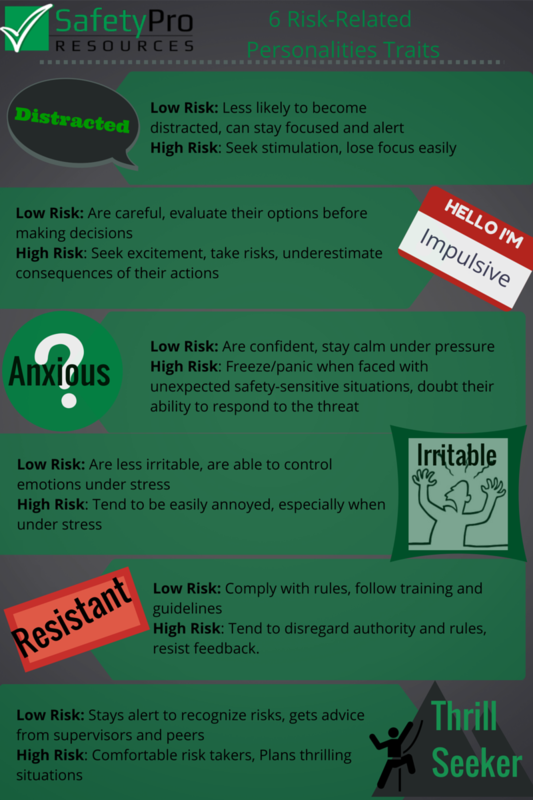 There are six main safety risk personalities that Talent Click has identified: Resistant, Anxious, Irritable/Impatient, Distractible, Impulsive and Thrill-Seeking. Each of these have high and low risk versions of each other, below is a chart we have made to simplify things. You may have noticed one was added since last year, this is because Talent Click realized that there was a group of individuals that were adventurous but not impulsive; they planned their risks without seeing them as such. Determining the risk personalities of your workforce is the first step towards bringing your safety culture to life. It is extremely easy to take this Safety Quotient™ test; it generally takes less than 30 minutes to complete. The questions are designed to rate your risk tolerances towards specific situations. Upon finishing the assessment, the results can then be discussed with safety self awareness coach. It is interesting to note that most people have a tendency to have at least one personality trait that they score high risk in. With proper training in safety self awareness, you can reduce you and your company’s risk levels drastically. I recently had a discussion with Steven Rice, inventor of Safety Quotient™ and co-founder of Talent Click, where we discussed what it means to be self-aware in safety. It is really about “getting that internal dialogue” going rather than having a supervisor look over your shoulder. Although this is a difficult task as times, with proper training and guidance it can be done. Realizing just how important safety self awareness is and analyzing how to improve this in your company is the first step toward a great safety culture.